General [http://www.yale.edu/directions.html Directions] to Yale University are posted on the University webserver. These include a detailed University [http://www.yale.edu/yaleinfo/maps/5.html map] locating the Bass building in the Science Hill area. Directions locating the Bass building on Science Hill is available [http://www.gersteinlab.org/people/directions.html here]. (Some of these maps are locally [http://bioinfo.mbb.yale.edu/~mbg/yale-maps mirrored]; in particular, a [http://bioinfo.mbb.yale.edu/~mbg/yale-maps/ConnAndVicinityReliefMap.gif relief map] of Connecticut and a map of the [http://bioinfo.mbb.yale.edu/~mbg/yale-maps/TownsOfGreaterNewHaven.gif towns] in the New Haven area). 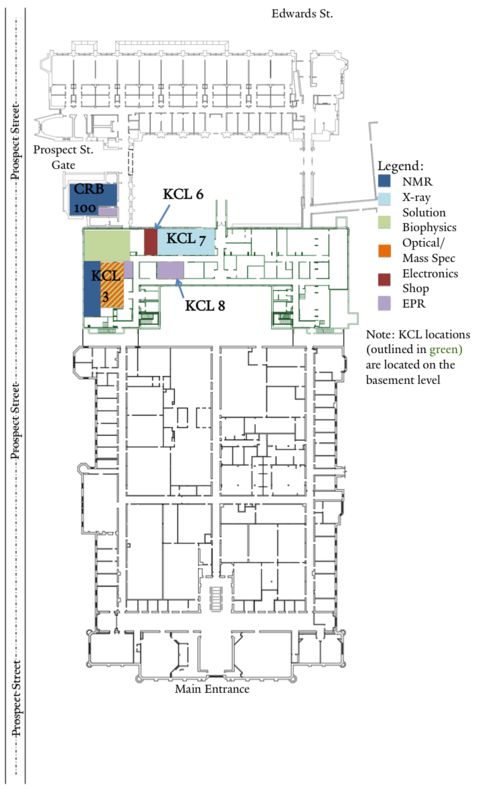 For walkers, note we're : [http://goo.gl/maps/ihKii 29'] from the center of the Medical School at 300 Cedar St., [http://goo.gl/maps/GtECl 23'] from 300 George St., [http://goo.gl/maps/vjNKv 9'] from food area at Whitney & Audubon (e.g. Gourmet Heaven & Koffee), and [http://goo.gl/maps/ANU4B 7'] from Orange & Pearl Streets (location of Cafe Romeo). For walkers, note we're : [http://goo.gl/maps/ihKii 29'] from the center of the Medical School at 300 Cedar St., [https://goo.gl/maps/eFGPhmcznaH2 22'] from 300 George St., [http://goo.gl/maps/vjNKv 9'] from food area at Whitney & Audubon (e.g. Gourmet Heaven & Koffee), [https://goo.gl/maps/V1civ2V3szj 12'] from Bass/Stirling Library [http://goo.gl/maps/ANU4B 7'] from Orange & Pearl Streets (location of Cafe Romeo). For walkers, note we're : 29' from the center of the Medical School at 300 Cedar St., 22' from 300 George St., 9' from food area at Whitney & Audubon (e.g. Gourmet Heaven & Koffee), 12' from Bass/Stirling Library 7' from Orange & Pearl Streets (location of Cafe Romeo). This page was last modified on 12 January 2019, at 17:39. This page has been accessed 208,560 times.